Asset allocation is a critical aspect to wealth management. This is true for both goals of growing and protecting your wealth. A good advisor will determine your overall financial goals, an investment plan to achieve those goals and then ongoing advice on asset management that may require a rebalancing of the asset classes. The plan will have a mix of capital growth and income yield investments. Realestate investment, excluding the principal home, is usually circa 20% of a High Net Worth Individual’s (HNWI) asset portfolio. Are you in line with that level of asset allocation? Yet diversification is key to minimising risk, so that 20% of net wealth should be invested across several properties, i.e. not just one or two. 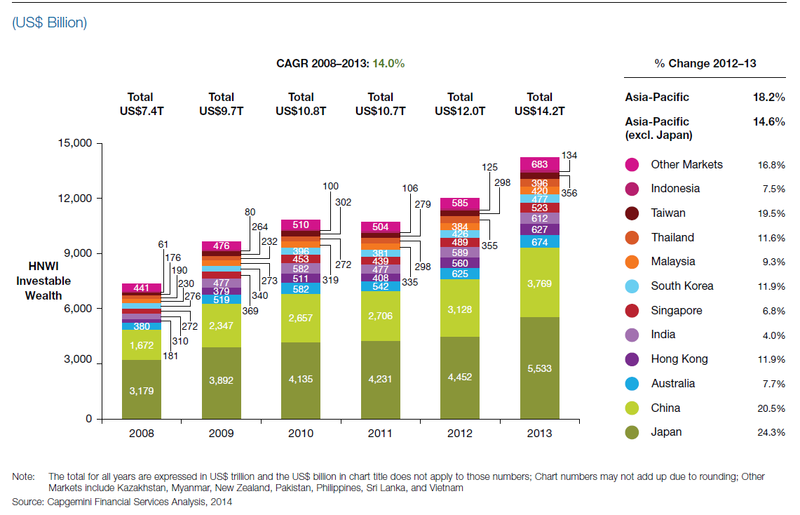 Capgemini and the Royal Bank of Canada produce the Asia-Pacific Wealth Report, the most recent 9th edition of the report was published in late 2014 www.worldwealthreport.com . That report has some very interesting survey findings from more than 4,500 HNWIs across 23 countries. A HNWI is defined as an individual with assets over USD$1 million, excluding the principal residence. The 4.3 million HNWIs represented a total wealth of USD$14,200 billion. 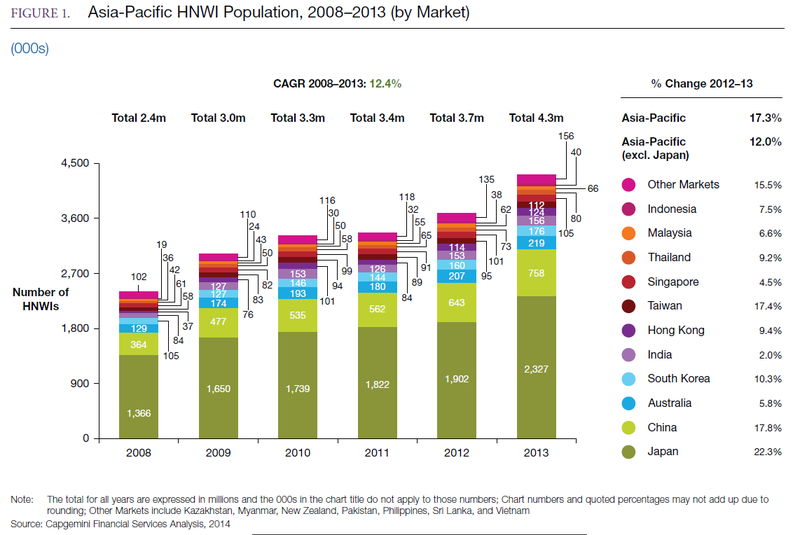 Australia’s 219,000 HNWIs had total wealth of USD$ 674 billion, which gives an average of around USD$3 million per HNWI. 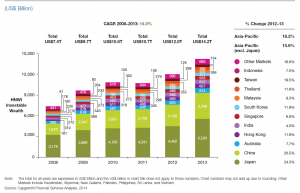 Singapore’s 105,000 HNWIs had total wealth of USD$ 523 billion, which gives an average of about USD$5 million per HNWI. 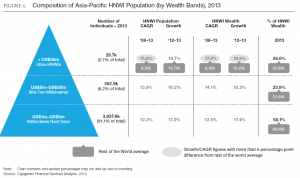 It is interesting to note that the Mass Affluent makes up 91% of the 4.3million HNWIs, i.e. millionaires living next door! The Survey results show that across Asia Pacific – excluding Japan – around 40% said they wanted wealth growth as the focus and 30% said they wanted wealth protection as the focus. Survey respondents over the age of 60 had a stronger, almost 55% focus on wealth protection. Is it surprising that Australians love real estate as an asset class? Too few eggs in the basket, so diversify more! If we assume the average price of an investment property in Australia is USD$500,000 then the Australian average HNWI could buy outright 2 investment properties, or with a 50% loan to value ratio (LVR), 4 investment properties. Likewise, if we assume the average price of an investment property in Singapore is USD$1 million, then the Singaporean average HNWI could buy outright 1 investment property, or with say 50% LVR, 2 investment properties. From a diversification and risk mitigation point of view, many advisors would consider this as too much concentration, as the saying goes “too few eggs in one basket”. For example, if you had USD$ 1 million to invest in equities, would you put it into just two companies? We would guess your answer is, no. You would most likely choose a basket of growth stocks and dividend yield stocks, and across different industry sectors. Similarly, this level of concentration in one to four properties represents a high level of concentration. The essence of the DomaCom platform means that each property is in a segregated sub fund. This means that an investor can choose between buying 100% to only 1% of the units in the sub-fund, which holds one property. Another aspect of diversification is ‘hunting in packs’. Not every investor is an expert, and so needs a mastermind group or perhaps to hire a real estate expert. This allows for someone who is not an expert in the chosen property geographic area, or expert in the property asset class, to ride on the back of experts who have selected, screened and already buying the majority of the units in the specific property sub-fund. This is particularly important for a foreign investor buying real estate in a different country, such as Australia. Safer to simply hunt in packs! Through local Australian finance houses, loans will become available to leverage off the segregated mutual sub-fund. It’s important to note that this is not a mortgage on the underlying property. It is simply a loan linked to the mutual fund and more specifically only that particular sub-fund. It is very much like a margin lending facility on listed equities. Following Spring Financial Group’s approval of the DomaCom platform a couple of months ago, we have been working closely with them to finalise their property portfolio offerings. Spring Financial Group’s expertise in direct property investing is well known and we are delighted that they see the merits of the fractional ownership approach. Diversification is the backbone of modern portfolio theory and Spring Financial Group have assembled more than 50 high quality properties in a series of boutique and landmark projects developed by some of the countries most experienced and best regarded developers. They have packaged these into portfolios of 5, 10 and15 properties each. Each portfolio will consist of properties in leading inner-city geographic locations. In this way portfolios can both maximise upside and minimise downside by spreading the investment risk so your clients avoid having all their eggs in one basket. To meet the needs of these multi-property portfolio bookbuilds, DomaCom has upgraded the platform technology to make it easier for financial planners to bookbuild multiple properties simultaneously. Stay tuned for more information on property portfolios. This capability will be opened and available for public bookbuilds in late 2015. In the meantime, interested advisers who would like further information about how their clients can access Spring’s diversified model portfolios, should contact us directly or contact Spring’s group general manager Mitchell Ansiewicz at mithcell.ansiewicz@springFG.com . managedaccounts.com.au (ASX: MGP) is the first managed account provider to add the capability of fractionalised real property onto their platform. Managed account solutions offer portfolios created to meet specific investment needs; defensive, conservative, income and growth but until now, real property has been under-represented from many model portfolios. Property is our largest asset class and with less volatility than equities it should play a pivotal role in anchoring investment portfolios, particularly residential property which has been absent in managed account portfolios. For example, an income portfolio should have some higher yielding commercial property and a growth portfolio should have some residential property, as the low volatility of property is ideal for a defensive or conservative model. The integration with DomaCom will give advisers access to any property in Australia provided a bookbuild can be completed. Advisers can initiate a private bookbuild within their own client base or a public bookbuild for a wider audience. Offering property exposure within a managed account portfolio will give advisers, particularly those working with SMSFs something they have never had. Property is a major asset class in high demand but until the DomaCom solution, something that had to be managed externally to their managed account and usually, as a whole asset purchase. The DomaCom model makes it easy for advisory firms managing client portfolios to add property without the need for LRBA arrangements. There is no other platform where financial advisers can precisely set the asset allocation to real property proportionate to their clients’ need, other than on DomaCom. Marc Evans, Afiniation co-founder and head judge said that the winner of the disruption category is going to change the way that the financial markets work moving forward. The judging panel felt that DomaCom really is a new way to invest in the Australian property market and that this new innovation will fundamentally disrupt the way people can invest in housing in Australia. Our objective in creating DomaCom was to make property more easily available and affordable to investors by eliminating the need to buy a whole property. DomaCom will be one of three speakers, with an educational focus upon asset allocation and fractional investing (1% to 100%) in Australian Property. Which experts should clients engage when investing in property? Australians love property! Just as most people wouldn’t seek advice from friends about heart surgery if they weren’t a surgeon, it is important to realise that the same level of awareness should apply when investing hundreds of thousands of dollars in property. It’s therefore also important as Advisors when working with your clients, that you help them to understanding that risk mitigation is factored into establishing a property portfolio and that engaging experts is part of the process. Investors should think of property investing as a business – where their team of experts all form part of the success of that business. Independently, they help them to maximise the investment opportunity, minimise tax and/or risk, while collectively they combine their expertise to increase your success multi-fold. If they were building a house, they would need expert advice to ensure the foundations, concrete, frame, bricks and mortar were sound and kept their house standing strong and upright. There would be significant consequences if they found out the concrete was too thin and the mortar too weak AFTER the house has been built! The same applies when engaging experts to help them in the property investing process. 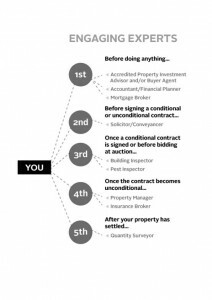 After they have purchased the property, it’s too late for these experts to help. As you can see in the chart above clients need different experts to be engaged at different stages, and some of them need to be engaged simultaneously. 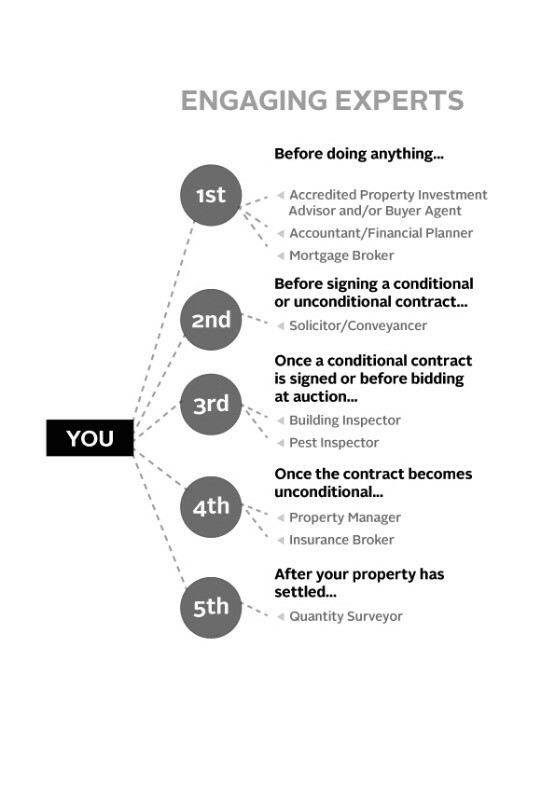 The chart shows they will usually need nine professions to ensure their property transaction is sound – and all their experts will play a very important role. As with any business, they should seek out the best experts available who specialise in working with investors to successfully build a portfolio. Why? Because they need to step into the future with them and consider all of the implications – how big they want to build their portfolio, what type of properties they will buy, which strategies they will use and who will benefit financially and when – so that they can provide the correct advice, planning and structuring in advance. Some of the article content is extracted from the book Property Prosperity – 7 Steps to Buying Like an Expert by Miriam Sandkuhler © 2013, with the authors permission. Unlike most ‘Property Advisors’, Miriam is an Accredited Property Investment Advisor (PIAA), Licensed Estate Agent and REIV member and multi award nominated Buyer Agent, with 15 years of real estate experience in two States. She is also the author of the book Property Prosperity. Miriam and her team excel at identifying high-performing property that deliver strong returns and stable tenants, while strategically building a client’s portfolio with high capital and income growth property. She has a strong track record helping investors and home buyers and believes education is the key to empowering people on their journey to achieving their goals.